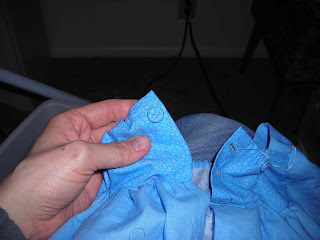 Covering buttons: cut a circle of fabric that's just more than twice the diameter of the button to be covered. Work very small gathering stitches by hand around the outside edge. 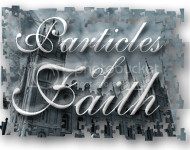 Put the button in the middle, and draw the gathers up nice and firmly. 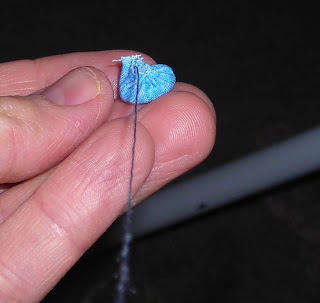 Sew through the little gathered up knobby several times to anchor things well. It can then be sewn down to the dress. It's a historically accurate technique. Ha! This way you don't have to go buy all those little metal buttons! 1. 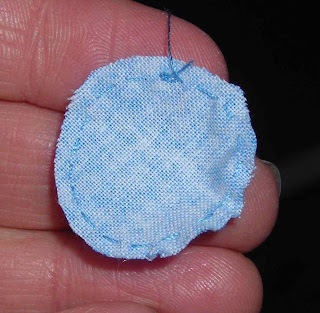 Cut your circle (a little more than 2 x the diameter of your button), work small gathering stitches near the edge of the circle. 2. Put in your button, pull up the gathers (sorry about the fuzzy picture). 3. Sew through the gathered up part. 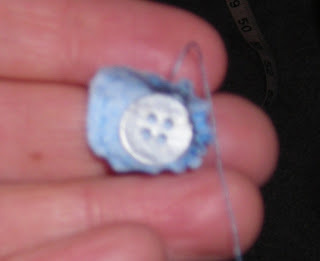 2/22/12: Ashley at Make It and Love It posted some really great pictures regarding covering buttons. Actually, people *can* go ahead and look closely... that's the beauty of it, and one of the main reasons I recommend it. It's a historically accurate technique for covering buttons, and using covered buttons can be 100% accurate on most mid-century clothing. Pretty cool! I wont ever have to by those button cover kits again, Awesome!